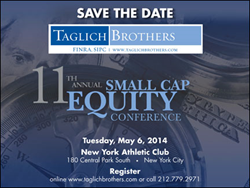 OxySure Systems, Inc. is pleased to announce that Julian Ross, CEO of OxySure® Systems, Inc. (OTCQB: OXYS) will be presenting at Taglich Brothers 11th Annual Small Cap Equity Conference May 6, 2014. OxySure Systems, Inc. is pleased to announce that Julian Ross, CEO of OxySure® Systems, Inc. (OTCQB: OXYS) will be presenting at Taglich Brothers 11th Annual Small Cap Equity Conference May 6, 2014. The Conference will take place at the New York Athletic Club, New York City. To request additional information or to register, contact Taglich Brothers at 212-779-2971 or visit http://www.TaglichBrothers.com.